In late 1915, Chicago’s Essanay Film Manufacturing Company was in decline. World War I had halted the export of the once-formidable studio’s films to Europe, which had previously been a lucrative source of revenue; Charlie Chaplin, the company’s biggest star, was dissatisfied with the way the studio was run and had no intention of renewing his contract when it expired at the end of the year; and, worst of all, the Motion Picture Patents Company, a consortium of studios to which Essanay belonged that was intent on monopolizing the industry, was being sued by the United States Justice Department for violating the Sherman Antitrust Act. The most significant Chicago-shot Essanay films of this era were The Raven, an Edgar Allan Poe biopic directed with imaginative flair by Charles Brabin and starring the great Henry B. Walthall, and Sherlock Holmes, a seven-reel feature directed by one Arthur Berthelet. The latter was the first feature-length Sherlock Holmes movie as well as the first film in which the famed detective was portrayed wearing his soon-to-be-iconic deerstalker cap. William Gillette, an acclaimed theatrical actor who had originated this look onstage, reprised his role for the screen version. In her Chicago Daily Tribune review, film critic Kitty Kelly wrote, “It is a production to which Essanay may point with pride and may file away in the strong box for future and again future revival.” Unfortunately, the Essanay “strong box” was not strong enough. Sherlock Holmes does not survive today. The Raven, on the other hand, happily does survive and is available on DVD from Grapevine video. The Raven begins with an exceptionally bizarre prologue that traces Edgar Allan Poe’s ancestors all the way back to Ireland in the 18th century. This scene has absolutely nothing to do with the story that will follow but it does introduce some interesting trivia, such as the fact that Poe’s biological parents were theatrical actors. 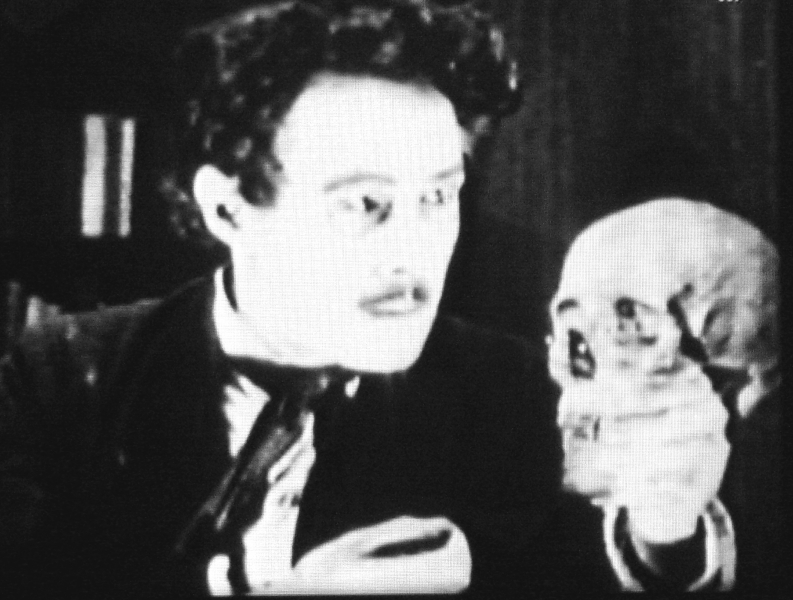 Brabin then shows a still photograph of the actual Poe, which dissolves into a close-up of lead actor Henry B. Walthall. The moment is startlingly effective because Walthall bears a striking resemblance to Poe — albeit if Poe had possessed movie star good looks. (Walthall’s casting may also have been the result of his having starred in D.W. Griffith’s Poe-inspired The Avenging Conscience a year earlier.) 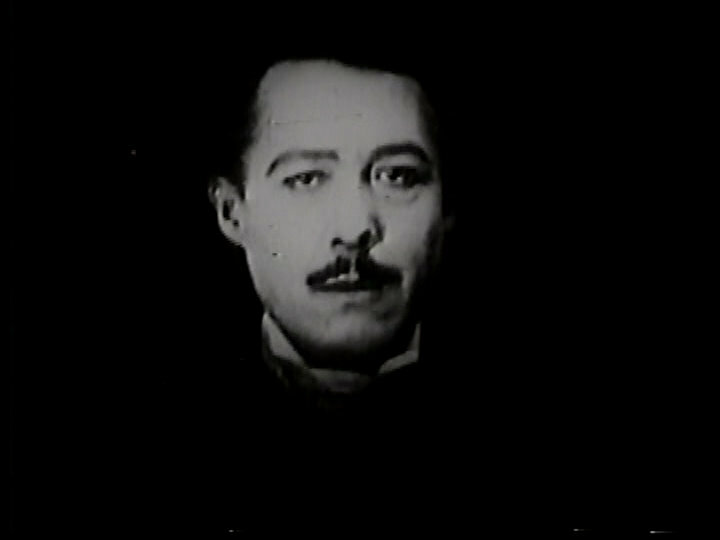 This dramatic introductory scene was also fitting for a star of Walthall’s caliber: The Raven was the eleventh of twelve films he would appear in that were released in 1915. (The second was Griffith’s The Birth of a Nation, in which he played the lead role of the “little Colonel.”) The Raven‘s narrative proper begins with Poe as a young man living in Virginia as the adopted son of the wealthy Allan family. Poe courts his cousin Virginia (the first of several women in the movie, real or imagined, to be portrayed by Essanay contract player Warda Howard). One of the most interesting sequences in the film is from this section: Poe sees a black slave being beaten by his owner and, though he cannot really afford it, arranges to buy the slave’s freedom. The shocking progressiveness of this scene as written is somewhat tempered, however, by the fact that the slave is played with broad comedic flourishes by a white actor in blackface makeup. The death of Poe’s beloved bride is seen as precipitating his descent into madness, which provides The Raven‘s dramatic high point: a reenactment of the title poem with Poe in the role of the narrator, alone in his study, taunted by a real raven and haunted by the ghost of his “lost Lenore” (Howard). In this scene, Walthall’s tortured and highly emotive performance is effectively matched by director Brabin’s use of proto-Expressionist high-contrast lighting and an impressive and creative use of superimpositions (e.g., a human skull appears as an eerie vision before Poe). The Gothic atmosphere of this climactic scene — and Poe’s “wine”-induced hallucinations — was certainly ahead of its time: the horror genre would not really catch on in the American cinema until the late silent era, after it had already fully blossomed in Germany. The Raven would prove to be the highlight of Walthall’s tenure at Essanay although he would continue to appear in productions for the studio on and off through 1917 before returning to Hollywood for good. Among the scrapbooks that belonged to Marvin Spoor (brother of Essanay-founder George Spoor and one of Essanay’s top directors of photography) that are now in the archives of the Chicago History Museum, one is devoted entirely to photographs of The Raven, an indication of just how important the studio thought the movie was. Charles Brabin would go on to a fairly distinguished Hollywood career, directing, among many other films, the Boris Karloff vehicle The Mask of Fu Manchu in 1932. He may be best known today, however, for being the husband of notorious stage and screen actress Theda Bara. Their long and — unusual for Hollywood — successful marriage lasted from 1921 until her death in 1955. The Grapevine Video version of The Raven can be purchased on amazon here: http://tinyurl.com/kg2drd9. It can also be rented from http://www.facetsmovies.com. Beware of public domain versions (including one uploaded to YouTube), which are not only missing scenes but garble the story by presenting the reels in the incorrect order. This entry was posted on Monday, December 2nd, 2013 at 9:52 am	and tagged with Charles Brabin, Edgar Allan Poe, The Raven and posted in Essays, Film Reviews. You can follow any responses to this entry through the RSS 2.0 feed. I must track this one down and watch it. I love all things Poe and this looks very fascinating. Great essay, Michael! Thanks, Vic! Make sure to let me know what you think. Very interesting. It is a pity that Charles Brabin’s Sherlock Holmes is a lost film. Reminds me of that story about F.W. Muranu’s Devils (1928) which is has been reported to have been “the greatest lost film ever” I may not be entirely correct about that, but I heard that a film historian had implied that. 4 Devils is certainly the lost film I would most like to see. Tod Browning’s London After Midnight also sounds amazing. Sounds interesting. I am a Poe fan and I would like to see the portrayal of Poe in this movie. Thanks for reading, Andrea. I hope you get a chance to see it.